When was the last time you left work at 5 p.m. confident you "owned" the day with supreme productivity? That means no to-do list items left tormenting you into slaving an extra 2-3 hours at the office, or signing back on at home. 23 minutes and 15 seconds – the tangible value of reducing EACH interruption, how far would you go to have this time back? Former professor at Harvard Medical School explains the reason you feel chronically inattentive, disorganized and overbooked like you have ADD – and why it's not entirely your fault! Everyone laments there aren't enough hours in the day. But not having the time to be productive is rarely the root cause. To be at your most productive most of the time, the challenge is to rethink the concept of "time management." In this Blueprint, there's no guesswork. No theory. No B.S. And, it's not hundreds of pages long. Because really, who has time for that! Just clear, easy to implement principles and hacks to help you channel your energy and focus in a way that gets the most out of the hours you choose the work. 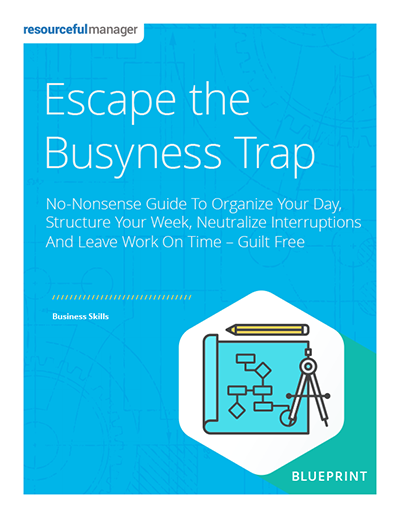 ResourcefulManager’s “Escape The Busyness Trap” Blueprint comes with an unconditional, 100% money back guarantee. We’re confident you’ll find several new and useful ideas to become more productive, presented in a practical, easy-to-implement format. In fact, we’ll give you a full 90 days to carve out the time in your busy schedule to read the Blueprint, digest the strategies, put the advice into action, and experience the results in your specific situation. If you decide “Escape The Busyness Trap” Blueprint doesn’t deliver value or simply isn’t your cup of tea, just email us at contact@resourcefulmanager.com within 90 days, and we’ll process your complete, no-hassle refund in 1 business day or less. 90-day "Must-Be-Resourceful Money Back Guarantee"